Signs of animal abuse may vary depending on the situation. Witnessing someone beating, hurting, or harming an animal is an obvious telltale sign. Seeing a pet left in a hot car during the summer or chained up outside may be more signs. Or noticing if the animal’s coat is full of fleas and ticks or bones protruding from the body, which indicates neglect. A too-tight collar or open wounds indicating injury show a lack of veterinary service and may cause dangerous infection if left untreated. Fleas or ticks covering the animal’s body. External parasites pose very real risks to animals. Skin disorders, like rashes or bumps, can indicate untreated health issues. Under or overweight to the point the animal is unable to move. Limping or obvious signs of discomfort when attempting to move. Leaky, discharging body fluid. Eyes offer the more obvious sign of infection. Dirty or matted coats prohibiting the animal’s movements. Dirty nails, ears, and noses are not considered normal. Weakness or inability to breathe normally. Animals are prone to many diseases and this may indicate a major health problem. Fear of humans. If an animal is scared of human contact, acting aggressive or cowering, including the owner. Malnutrition leads to a higher chance of physical discomfort and health complications. Signs of food aggression and resource guarding in an animal may indicate a lack of consistent meals. Animals locked in cages outside with little human contact. Animals may be kept in a very small area, unable to move around with multiple pets in the limited space. This is often a sign of backyard breeders, who may supply a pet store with animals for sale. Hoarders, where the owner loses track of the number of animals in house and the house is often in disrepair, filled with feces and garbage. Dirty or unclean food and water bowls. Brackish water breeds many parasites that may harm animals. A lack of food or water near the animal. Leaving animals outside in bad weather, such as high heat or freezing rain or snow. Chained up for very long periods of time with little human contact. This includes using cement blocks and poles as weights around the neck, which may indicate dogfighting. Animals left alone after a family moves or released right before moving. Oftentimes the animals are left to fight for scraps and cannot defend themselves when placed outside. If you witness any evidence of mistreatment, please contact your local animal control facility or humane organization immediately. The officers help maintain the quality of life for animals and are backed by municipal, state, and federal statutes. If possible, document the evidence for the officers and be willing to speak up in court should testimony be necessary. Take photographs, write down date/times, and remember that documentation may be used in a court of law. Neglectful and cruel owners may receive a felony charge if convicted. Additionally, psychological research indicates a connection between animal and human abuse, so speaking up may save more than an animal’s life. The Animal Law and Legal Center notes 30 states that include animals under temporary protection orders. And if you know of a dogfighting ring, please call the national Humane Society hotline at 1-877-847-4787. To report any puppy or kitten mill information, call 1-877-645-5847. Criminal behavior doesn’t stop when the match ends or a pet is carried out of a pet store. Click on a state above to view contact information for local animal welfare resources. Not every state will have dedicated authorities, but the local sources are always a good place to start. Remember, if an animal is in immediate danger do not hesitate to call 911 for immediate assistance. Your actions may save a life. Phone: 831-373-2631 or 831-422-4721 Ext. 213. The State of Florida recommends contacting local animal control and sheriff departments. 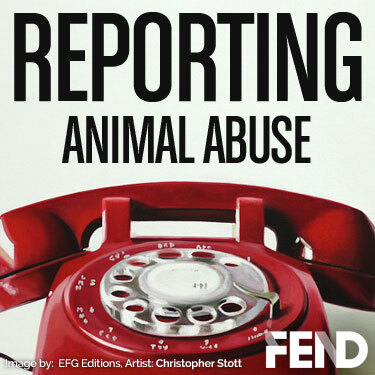 For local enforcement numbers, please visit http://arff.org/report-abuse. Note: The State of Georgia requests all information be given to local animal control and sheriff departments. Phone: 1-800-282-5852, ext. 4914 or 404-656-4914. For local enforcement numbers, please visit http://kaco.org/en/county-information/county-websites.aspx. For local enforcement numbers, please visit http://www.maine.gov/local. For local enforcement numbers, please visit http://www.dpscs.maryland.gov/onlineservs/sor/local_law_enforcement_agencies.shtml. For local enforcement numbers, please visit https://www.michigan.gov/documents/mda/Licensed_Animal_Shelter_List_By_County_Report_222946_7.pdf. To reach local authorities call 314-647-4400. Phone: 1-800-392-8222 or 573-751-3321 if outside the state. Note: Please file a report with local law enforcement officers. Please file a report with local law enforcement officers. Note: Nevada judges may include pets in a temporary protection order for domestic violence. Note: all complaints must be filed with local law enforcement agencies. Note: Please file a report with local law enforcement officers. To report state dog fighting rings, please call 1-866-697-3444. Note: Per state request, please file a report with local law enforcement officers. You may also contact the Animal Welfare Department at 919-707-3250. Note: Please file a report with local law enforcement officers. To view state-licensed shelters in your area, visit http://app.ag.ok.gov/petlicensing/.